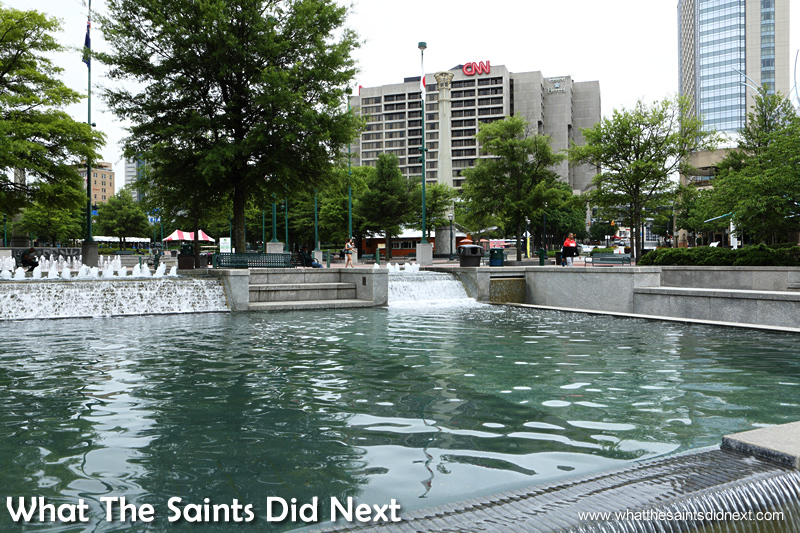 The CNN Center in Atlanta, viewed from Olympic Centennial Park. When CNN was launched from the CNN Center in Atlanta in 1980, I was a young boy growing up on an island still without VCRs and more than a decade away from live TV, where the latest news came exclusively via a BBC World Service radio signal relayed from a hesitant HF signal. So the CNN phenomena as the world’s first 24 hour television news channel kind of passed me by. Even so, when St Helena first launched a live TV rebroadcast service, sometime in the 90s, CNN was one of the first channels islanders received. And today I’m a big fan of the TV show, ‘The Newsroom,’ so visiting the CNN Centre in Atlanta, Georgia is going to be a treat. The wow factor kicks in simply entering the ginormous atrium, a huge cavernous space expanding way above us filled with light and large CNN flags suspended from the rafters. 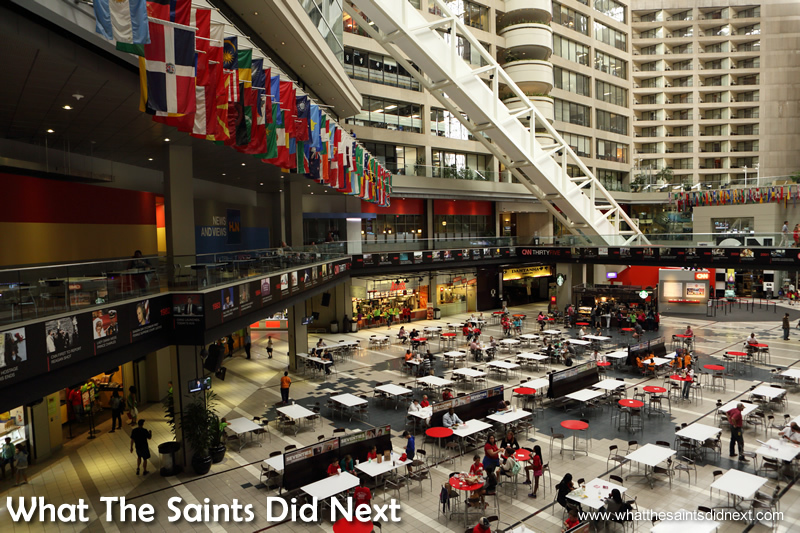 The view as we walk into the CNN Center building. The world’s longest unsupported escalator is hard to miss, it’s 8 storeys high. The CNN Center in Atlanta, Georgia. It’s hard to know where to look first; the floor in front of us is bustling with people, there is so much colour above us and off to the right is an escalator that is grabbing my attention simply because it just looks so long. It disappears into a huge blue and green globe of the world that looks a little Disneyworld-ish. The whole spectacle takes some time to absorb. 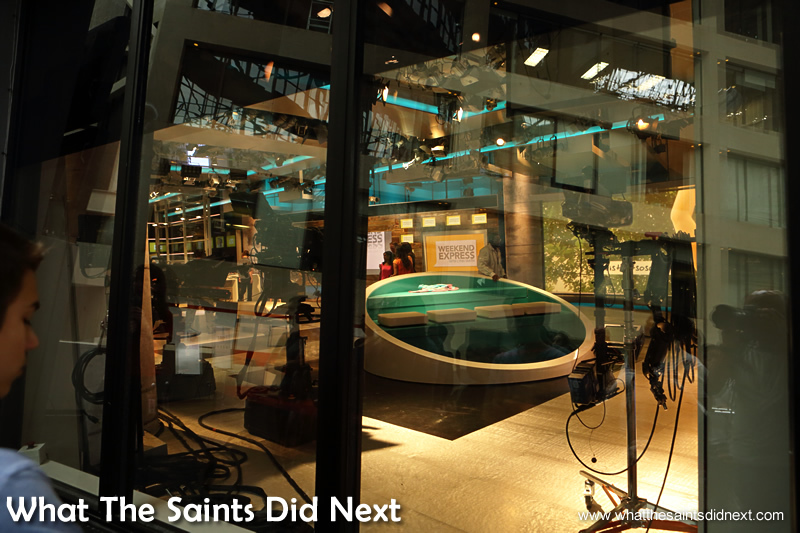 A new Behind The Scenes Studio Tour is starting soon so we quickly head for the entranceway near the bottom of the long escalator. The lady taking the tickets is being quite sarcastic to the couple with a baby stroller in front of us. It appears the stroller should be left behind because of the eight flights of stairs we will need to descend later, but the tone directed at the couple seems a bit harsh. Then we step forward, hand over our ‘City Pass’ ticket booklet which we had pre-purchased for Atlanta attractions. The ticket lady then treated us to her sarcasm, asking, “can you read,” before telling us there’s a notice above the ticket office saying booklet vouchers need to be exchanged for tickets! Tail between our legs we trotted back to obtain the required entry ticket. Heading to the middle of the world at the top of the escalator. 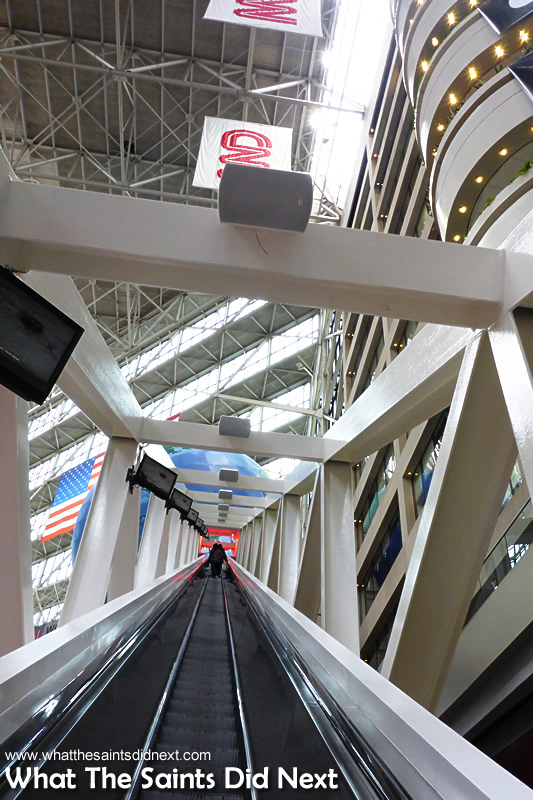 The world’s longest unsupported escalator in the CNN Center. The obligatory airport style security search of our bags, an anxious step through the metal detector and then we’re in and onto the long escalator. As we glide upward, camera clicking the view below, an audio recording informs us this escalator occupies a place in the Guinness Book of Records as the world’s longest, unsupported escalator at 196 feet. Sharon raises her eyebrows and nods approvingly. Up eight storeys we go and into the world globe. 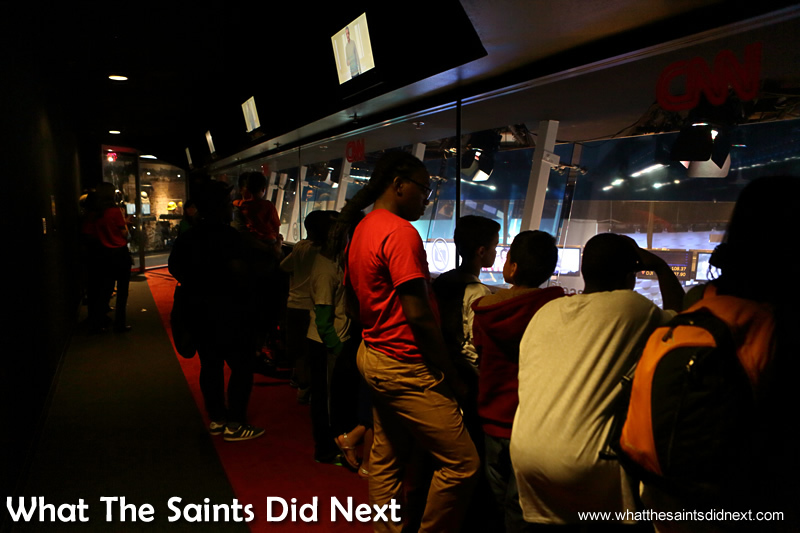 Very cool, but very high – I could feel my legs getting weaker the higher we went. There’s a standard pre-photo op (buy the print later) and then the tour begins. We get to watch a display of six live video feeds showing us what the news producer is using to put a news broadcast together, overlaid with live audio of the producers voice as he cues and orders the changing of each feed. I find this quite fascinating although the sound is hard to hear clearly. The screen goes blank as the programme cuts to commercials. Watching the live feeds while listening to the producer’s voice from the control room. The CNN Center in Atlanta, Georgia. Shuffling along and squeezing into the next room, we are now in a studio complete with automated cameras, a news anchor’s desk and the classic CNN styled, multi-screen backdrop. 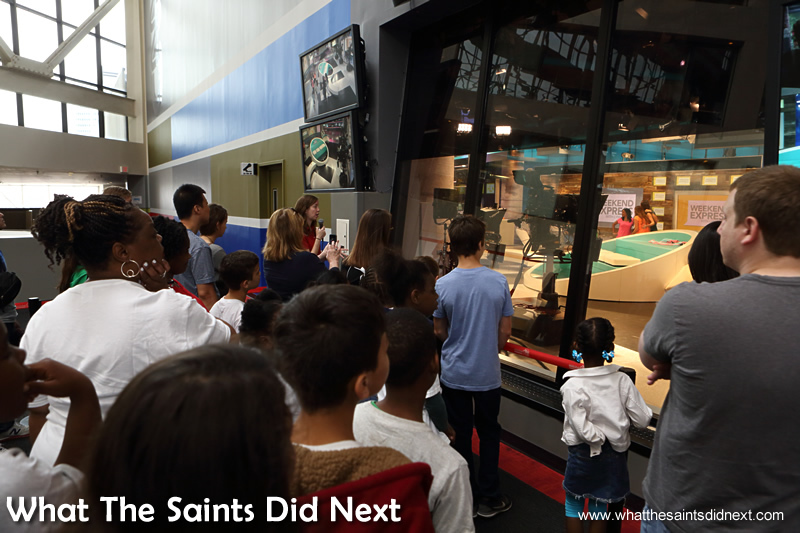 The demonstration in here includes the teleprompter, a device which allows presenters to read while looking directly into the camera. No shortage of hands shoot up from the children in the group when the guide asks for a volunteer to try it out. Must admit, I really would have liked to have had a go myself! Inside the demonstration news room which can also be used for live broadcasts. The CNN Center in Atlanta, Georgia. Sharon looking quite at home sitting to the News Anchor’s Desk. The CNN Center in Atlanta, Georgia. As the tour moves on I notice we have a security guard accompanying us from one place to the next. We all congregate on a darkened corridor with observation windows on one side, looking down into the CNN Newsroom. This is the nerve centre where all the news stories come in to the building and are then put together. 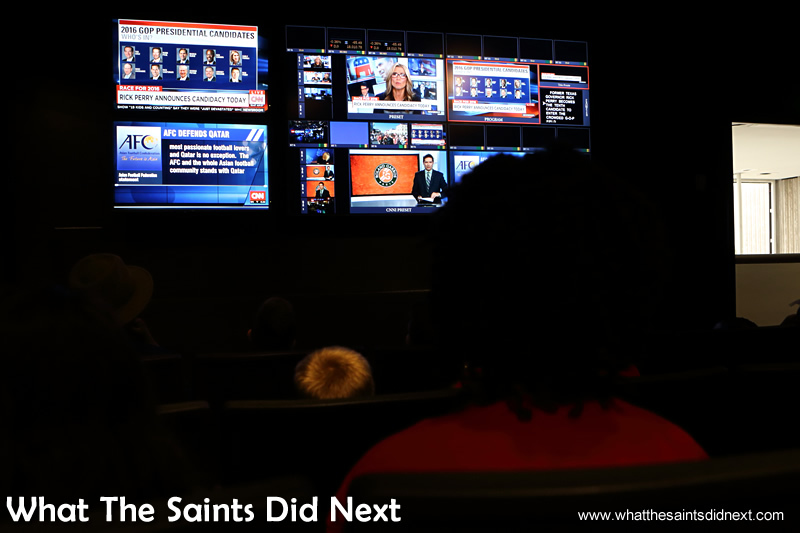 It’s almost funny to hear how stories take around six hours to be pieced together for a show, but then to learn the process for breaking news can take just five minutes. Next time I see ‘Breaking News’ on the TV ticker tape I’ll think of the poor guy who just had his six hours of researched story dropped. 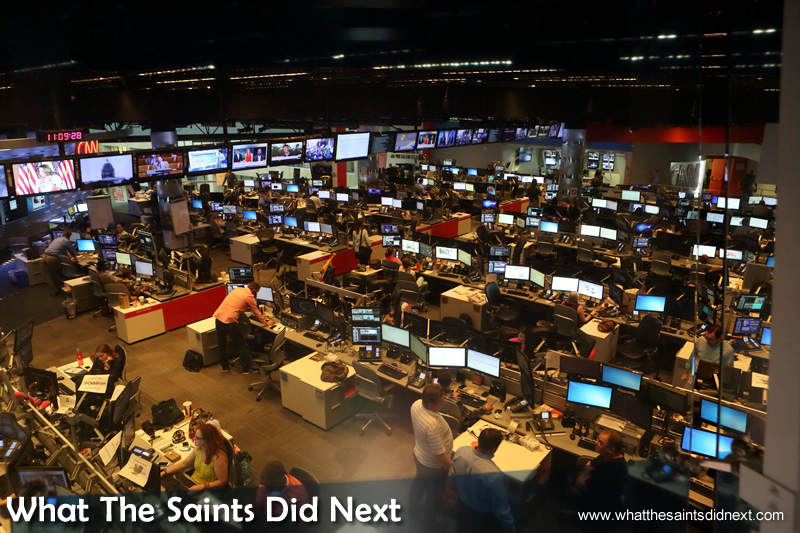 The CNN Newsroom, where it all happens. The CNN Center in Atlanta, Georgia. 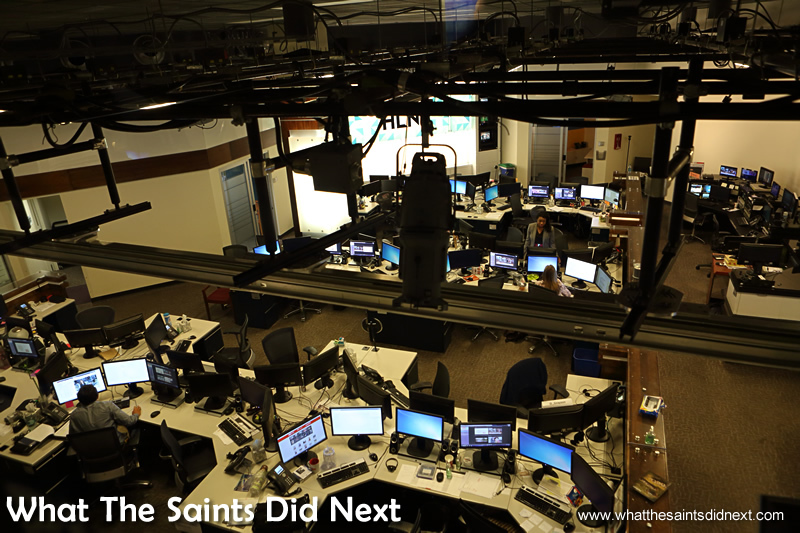 First impressions of the newsroom, it looks a bit claustrophobic and is not as spacious as the TV show version. A barrage of monitors and TV screens glare down on each workstation. I find myself wondering how many of the people there are on Facebook and what their internet speed is like. It must be fast. This is CNN after all. Studio 7 where most of CNN’s daytime broadcasting takes place is the next stop. Disappointingly we don’t get to go into the actual studio, rather we all assemble outside a large window to have a peek. A show is just wrapping, guests are having their picture taken with the presenter, HLN’s Robin Meade – according to the guide (Sharon and I have no idea who Robin Meade is). The set inside is being changed as we watch; large furniture pieces on wheels are being pushed into place effortlessly by the crew. Outside Studio 7 peeping in. 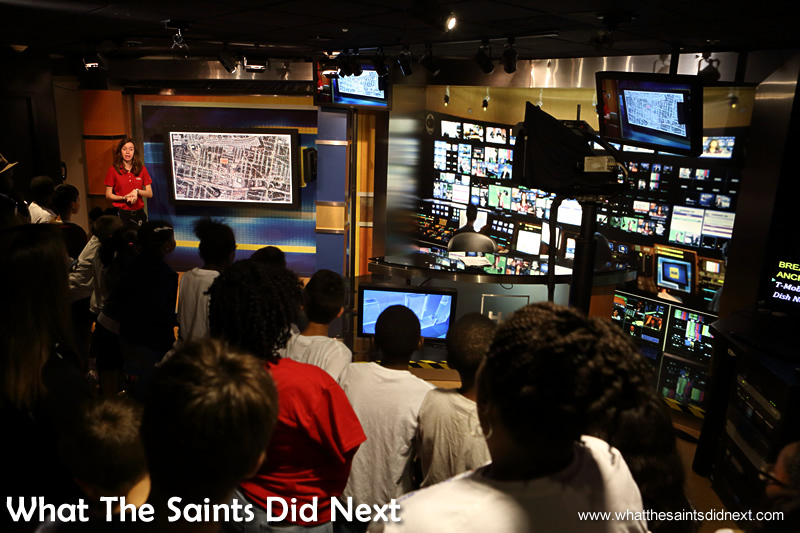 On the CNN Center ‘Behind The Scenes’ Tour. A closer look as the studio is being rearranged. A show production room. 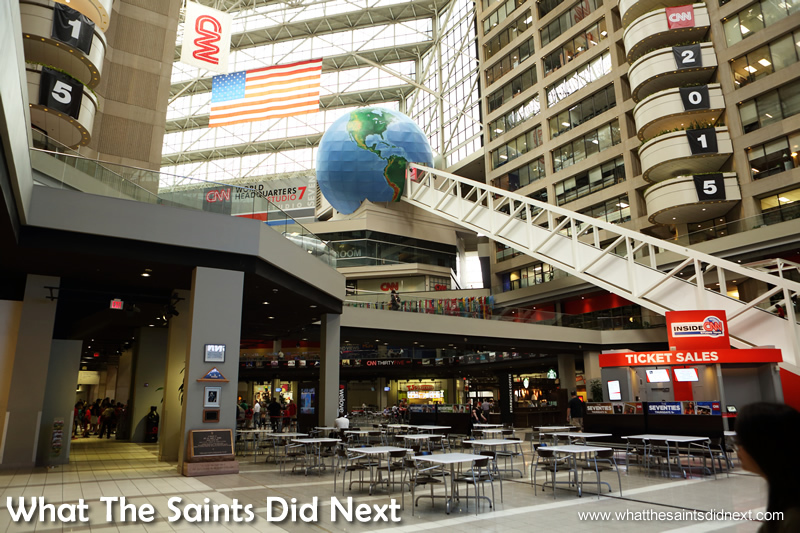 The CNN Center in Atlanta, Georgia. By now we are descending the eight flights of stairs between different parts of the tour, which the ‘attitude’ ticket lady had been talking about earlier. From a windowed gangway, similar to the newsroom, we look down into a show (as opposed to news) production room. There are more work cubicles, basically just a smaller version of the newsroom. This is not as busy but we are told the activity level goes up the closer it is to the production going to air. The tour is coming to an end. We were now down into the large open space of the atrium, on a balcony walkway, peeking into the CNN Espańol studio which seems to be quite important judging by the tour guide’s emphasis. Then finally we take a seat to view a film about CNN, projected onto a very wide panoramic type screen that looks weirdly like it was made from white bed sheets, but nonetheless, works very well. View of the hall from the opposite side as tour returns toward the ground floor. The CNN Center in Atlanta, Georgia. Over 2000 people work in the building, including a lot of armed security guards. We stayed on in the food court to eat our packed lunch and couldn’t help but notice the number of handguns we could spot from our position, which were worn on the waist holsters of the security guards. 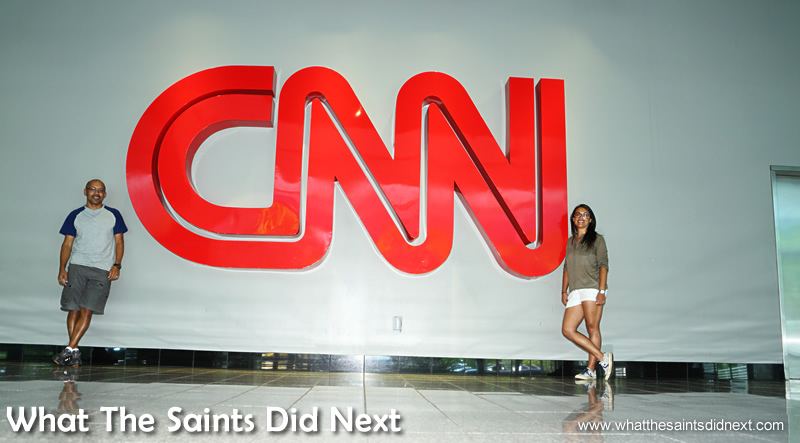 CNN Center Atlanta is just one part of the huge news network which is now viewed in over 212 countries around the world. 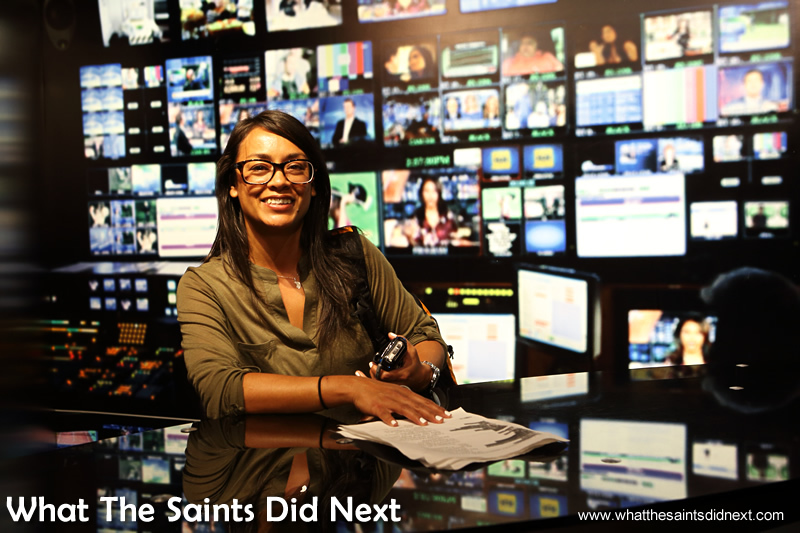 Broadcasts come primarily from their Centre in New York City and studios in Washington and Los Angeles. 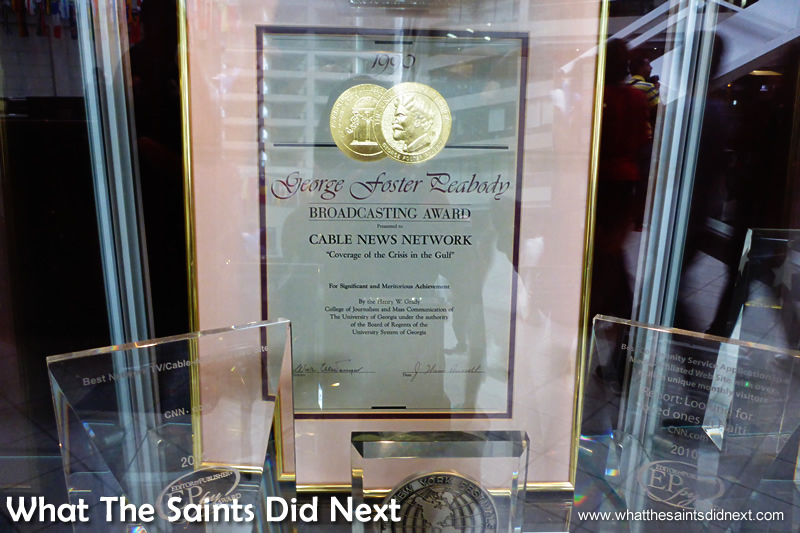 CNN was presented with a George Foster Peabody Broadcasting Award for their “Coverage of the Crisis in the Gulf” in 1990. We used our vouchers from our ‘City Pass’ booklet for this tour, but for anyone just popping in off the street, cost is $16. Apparently there’s also a VIP Tour ticket for $35. This is CNN. The Behind the Scenes Tour is over. 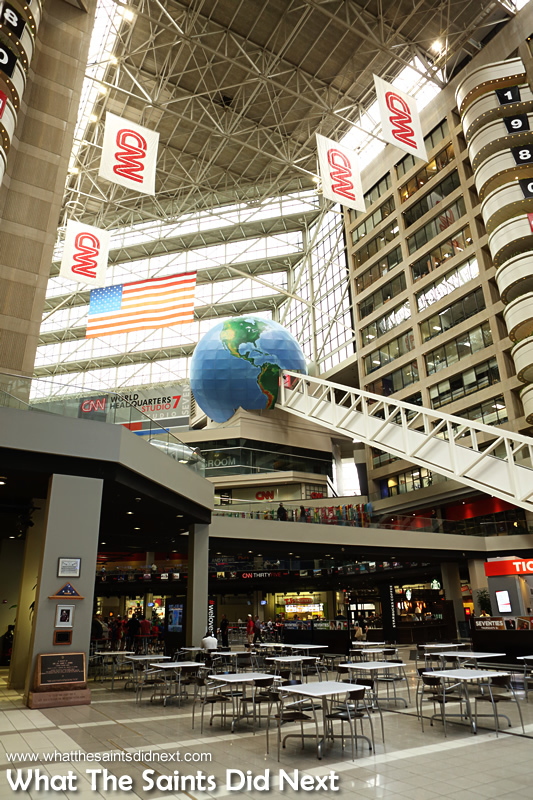 The CNN Center in Atlanta, Georgia. You can do a similar tour of the BBC in London (Broadcasting House) – I doubt if the security guards have guns though! It was something we had hoped to do when we were in London but it never quite worked out. Still can’t get used to the guns everywhere in the US. Thanks for the comment, cheers.